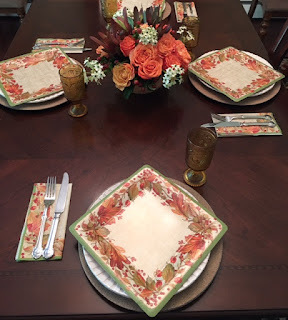 with "real" tabletop is my favorite table setting. warm and cozy to me. I only used the dinner fork and knife. sundance flowers, safari sunset & mahogany berries. with the boss in the background supervising. this early peak into fall table. including hyrandgeas, roses, china berries and bunny tail grass. what I believe is the Colony Park Pattern. from my sweet Aunt Mimi. I knew I wanted it for fall. turning from their bright green to gold. and still looks bold and brilliant today. while delicate scallops and blooms festoon the rim. reproducing treasured antique patterns since the 1950s. It is definitely an investment pattern. and more goodies for sale!